Update | 8:05 AM: Hillary's Howard tries to weasel out. See update at foot. Like Rudy and Romney going after each other over immigration last night at the GOP debate, MSNBC was taking some jabs at rival CNN this morning on the issue of the gay questioner who turned out to be a member of Hillary Clinton's campaign. "Morning Joe" host Joe Scarborough scoffed at the notion that no one at CNN was aware of retired Brigadier General Keith Kerr's involvement with the Clinton campaign. 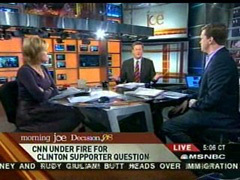 JOE SCARBOROUGH: This is twice now in a couple of weeks that CNN has been ensnarled in a Clinton controversy. Before with James Carville sitting there giving his opinions despite the fact that he's contributed to Hillary Clinton, obviously worked for Bill Clinton, he sent out letters saying we really need to fight hard for Hillary Clinton. They didn't even mention it. And again, the damndest thing. And last night, not only do they have this guy delivering a YouTube video, they also had him there sitting in the audience, they had a shot with him [more than a shot. Anderson Cooper asked whether he was satisifed with the answers he had received and grilled Romney over his answer. Kerr himself made an extended comment from the floor]. It's Bill Bennett [who was a CNN post-debate panelist], it is up to Bill Bennett to explain to CNN, and don't tell me that CNN didn't know, that some people at CNN did not know, that he was part of the Clinton campaign. Don't lie to me. Maybe Anderson Cooper didn't know, but somebody at CNN that put this guy in the video knew that. SCARBOROUGH: I'm not blaming Anderson Cooper. He can't do everybody's work for him. But it is total crap to suggest that nobody in CNN knew that this guy was from the Clinton steering committee, and that somehow Bill Bennett, a conservative that -- let me tell you -- does not check the Hillary Clinton gay and bisexual and transsexual Americans for Hillary Clinton steering committee list every morning. If he knows, don't tell me that somebody at CNN doesn't know, and don't tell me that Hillary Clinton's campaign didn't know. Neither of the other panelists were inclined to bail out CNN or the Clinton campaign. MIKA BRZEZINSKI: I guess the real troubling thing here is that first of all Hillary Clinton doesn't need, it's the second time now a planted question is making that campaign look bad, and it's not something they need to do. WILLIE GEIST: Let's say it was a plant. Let's say Hillary Clinton's campaign called him and said "put your question up on YouTube." Hillary Clinton's campaign isn't the one picking the questions for the debate. So they can put all the questions they want up there. But isn't it up to the group putting the debate on to vet those questions? SCARBOROUGH: Well it certainly is. And again, my point is this. I believe Anderson Cooper did not know. And I'm sure a lot of people at CNN did not know. But if Bill Bennett, while on the air, gets an email that says that this guy is a member of that task force, then they should have known. And I'll tell you why this bothers me. It bothers me because these are the type of questions that people love asking Republicans. They love getting [adopting a deep, serious voice] a strong military guy who's gay, God bless him, I love him, and then vilifying the Republican party. How in the world can you not want gays and lesbians and transgender, transsexual Americans in the military? And it was a clear set-up question, and I agree with you, Mika, I don't think it helps the Clintons: they don't need it. Hillary Clinton doesn't need it. BRZEZINSKI: I can't imagine people high up in the campaign would support something like this. I actually emailed sort of two high-ranking members of the campaign at five this morning. So hopefully we'll hear something back. b. Hillary's campaign is out of control, its senior people unaware of rogue operations being carried out by low-ranking aides. Neither possibility paints a flattering picture of the woman who would be Commander-in-Chief. As for CNN, I'd say it's time to invoke the "two strikes and you're out" rule. For that matter, throw in Wolf Blizter's abject failure to question Hillary on her licenses-for-illegals flip-flops, and you have three examples of CNN being in the tank for Clinton. Note: Michelle Malkin has the goods on no fewer than four plants among the YouTube questioners. Update | 8:05 AM: Hillary's Wolfson tries to weasel out. At 7:51 AM ET, Mika announced that she had received a reply from head Hillary honcho Howard Wolfson. 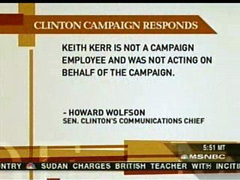 As displayed on screen, Wolfson stated [emphasis added]: "Keith Kerr is not a campaign employee and was not acting on behalf of the campaign." Chris Matthews, a guest during the segment at the time, was unimpressed. CHRIS MATTHEWS: Well "employee" could be a weasel word, too. I mean, he's not being paid? Well that's not the question that was asked. Note also what Wolfson didn't say. He didn't claim the Clinton campaign was unaware of what Kerr was up to, nor did he say that the campaign hadn't encouraged him to do this. "Not acting on behalf of the campaign" is a meaningless non-denial denial. Editor's Note (Ken Shepherd 08:18): It should be noted that CNN's Anderson Cooper quipped in a recent interview with Townhall's Mary Katharine Ham that "campaign operatives are people too," justifying political hacks posing questions at debate forums.